Preheat the oven to 140�C. Place a small saucepan over high heat and add the oil. Add the shallot and herbs, and sweat for 1 minute. Pour in the Madeira, sherry and 50 ml of the port. Cook for 10 minutes or until reduced to 50 ml. Strain, discarding the herbs, and transfer to a food processor. Add the foie gras, liver, salt and pepper and blend until smooth. Add the eggs one at a time, then very slowly add the butter while continuing to blend. Pass the parfait mixture through a fine chinoise, then spoon it into a 750 ml-capacity terrine mould and cover with a lid or foil. 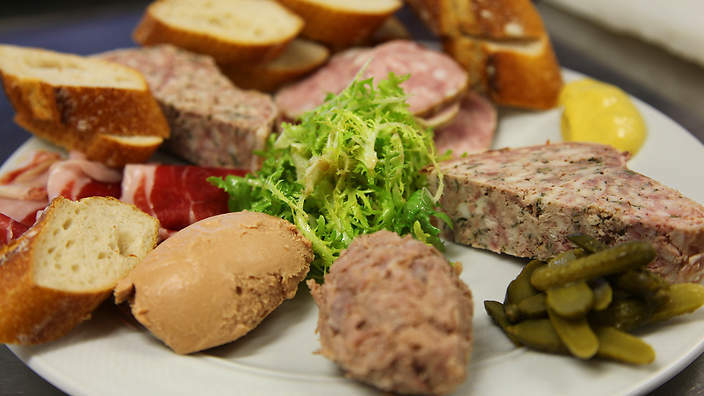 Place the terrine into a roasting tin half-filled with hot water and cook for 40 minutes or until set. Remove from the oven, allow to cool.